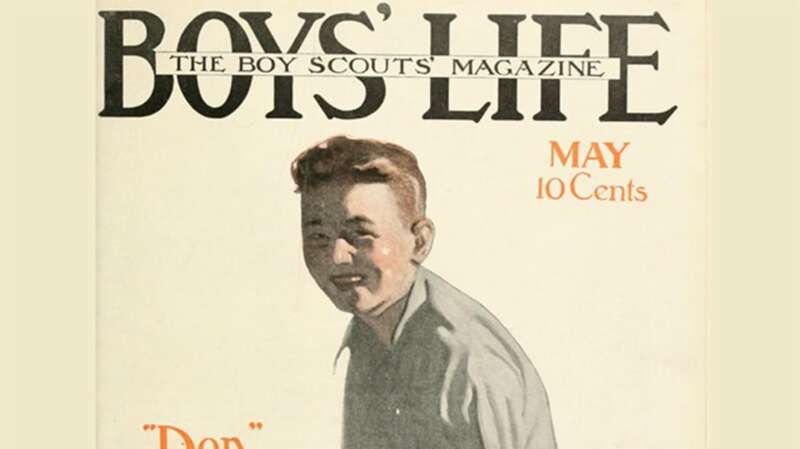 Boys' Life magazine is targeted at Boy Scouts. It began publication in 1911, and is still running today. When I was a kid (and a member of the Webelos), I'd read the magazine—but not for the articles. I was there for the ads in the back. They were a little nutty, often encouraging kids to sell things door-to-door in exchange for prizes. Many also advertised knives, bike repair kits, exotic pets, magic kits, wrestling outfits, and all manner of things I wanted but couldn't afford. So I decided to see what the ads in the magazine were like precisely 100 years ago—the issue from May 1915 (you can read it online). I suppose it's not a surprise that this wacky ad thing has been going on for a century. Here are my favorites. Well, if 87 Boy Scouts succeeded in making $2.34 selling gliding casters, why not be the 88th? Jumbo Pigeons with dollar signs on them! Earn this lawn swing (of unspecified size) in exchange for selling 210 bars of soap. Seems downright easy. It says right there: "You can earn it in an hour or two." Sure. "The Pony Man will send you pony pictures and tell you all about the other boys and girls who have won ponies in the past." I think your odds of getting the actual pony are slim to none. "Each auto sold means more tires to mend." Still true. Also: "Be the first to start. Experience unnecessary. You learn quick. Simply follow directions. Business comes fast and easy." 6. All the Spending Money You Need! Again, this one suggests you might want a pony (or a canoe, camping kit, or gun). What's up with ponies? Anyway, this silver-cleaning business is a surefire winner. What wealthy aristocrat doesn't want some little kid cleaning the silver? The profit claims made in these ads are kind of extreme. Up to $60 per week (in 1915!) selling mushrooms? I guess it's technically possible, but I'm not sure the local door-to-door mushroom saleskid is gonna make that kind of dough. 8. Boys, It's Your Ammunition! "They hit where you aim." I certainly hope so! Was there really a thriving market for custom rubber stamps sold by children? I guess it's technically possible. This is the craziest unicycle I've ever seen. I do not understand this. I also don't understand how a normal kid is going to sell these things to his peers. "Fish bite like hungry wolves." Run away from the wolf fish, children! "For all wide-awake boys there are Shirts of the right sort. There is perfect fit, man-like styles, clean finish, hand-tailoring, exclusive patterns." I do enjoy the creepy sameness of the kids (looks like two photos of two similar-looking kids, right?). "The stuff that muscle is made of. The vigor of living and the health of the sun and soil are in every shred." I'm not going to lie, I love Shredded Wheat. But I'm not sure it added much muscle to my frame. Maybe I should've prepared it on a camp stove? Three ads for summer camps. One has a "wholesome moral atmosphere," the other is "for boys of Christian parentage." Sounds like fun. 15. The Knife They All Want! It may be unsinkable, but I'll wager it's still capsizable. Similar to the above, but this "farm wagon" actually includes dimensions. Seems legit, assuming you can sell a bunch of overpriced soap. So... this ad seems to posit that the Great War would destroy Belgium, Turkey, Germany, England (! ), France (!! ), Russia (!!! ), Bosnia, Japan (!!!! ), Servia [sic], and Austria-Hungary. So the thing to do is collect their stamps before these countries die? Ugh. The answer is obviously yes, but the suggestions that it "almost runs itself," and that you can "sell to your friends" seem super-bogus. "Lots of nourishment and a taste that goes fine with bread or crackers." Well, ma, I'm just headed down to the fishing hole with this poorly-sketched peanut butter sandwich and my stick-fishing-pole. With my Magic-Fish-Lure (#11), I'll be bringing home dinner. Please buy more crackers, they'd taste fine. All images courtesy of The Internet Archive, where you can find the whole magazine, along with many others. See also: The Boys' Life Wayback Machine.